This recipe for chicken and dumplings was shared by Sandy. The stew is made with a cut up chicken, broth, and vegetables. The buttermilk dumplings can be rolled and sliced or bits of dough can be pinched off and dropped into the boiling broth. Place the chicken in a Dutch oven or stockpot and add the water, broth, carrot, onion, celery and salt. Bring to a boil, cover and lower heat. Simmer for 60 to 70 minutes, or until the vegetables are tender and chicken is done. Remove chicken to a bowl to cool. 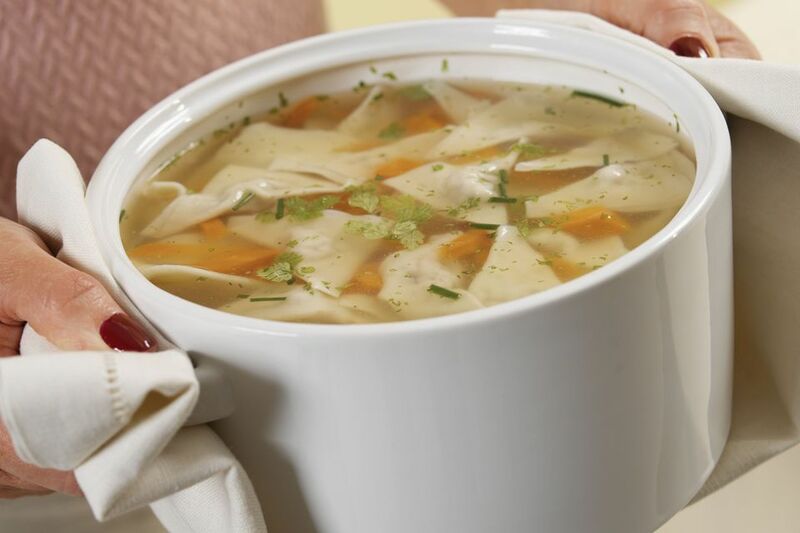 With a slotted spoon, remove the carrot, onion and celery pieces from the broth and discard (or add the vegetables back to the broth later with the chicken). When the chicken is cool enough to handle, remove the meat from the bones. Discard skin and bones and cut the meat into bite-size pieces. Set aside. In a large bowl, combine the flour, baking soda and 1/2 teaspoon salt; cut in the shortening with a pastry blender or two knives until mixture is consistency of coarse meal. Alternatively, mix with a food processor. Add the buttermilk and stir just until dry ingredients are moistened. Turn dough out onto a floured surface and knead 4 or 5 times — no more than that. For rolled dumplings, roll the dough to a 1/4-inch thickness, and cut into 3" x 1" strips. Bring the chicken broth to a boil; stir in the milk and pepper. Correct seasonings, if desired. Drop the dumplings, one or two at a time, into the boiling broth and reduce heat to medium-low. Stir from time to time to make sure dumplings do not stick together. Cook the dumplings for 8 to 10 minutes. Add the reserved cut-up chicken to the mixture and simmer until heated through. Sandy's Notes: Dumpling dough is very similar to biscuit dough and, like biscuit dough, the less it is handled, the lighter and more tender the result. Grandma made this all the time and they were great!